Nothing says camping like an awesome roaring campfire right? I know I love a good campfire – especially when it’s cold! Okay, if I’m being honest – I love one pretty much anytime as long as it involves marshmallows. The smell of a campfire means the smell of camping – which I love. Learning how to build a campfire is one of the basic skills that beginning campers need to know. Extra points for those of you out there who can learn to start one with just one match! There are several important things you’ll need to do in order to safely build a cozy campfire. In order to get started, you need to figure out where you’re going to build your campfire. In established campgrounds – always use the existing firepit that is provided at your campsite. When there isn’t an existing firepit, you’ll want to create your own. In the best case scenario you should choose a spot that has clear ground for 10-14 feet around your fire pit with no tree branches or bushes nearby (and especially not overhanging your firepit.) I realize that sounds like a huge amount of room and it’s not always possible – but that’s the very best situation. Just shoot for as much clear space as possible. 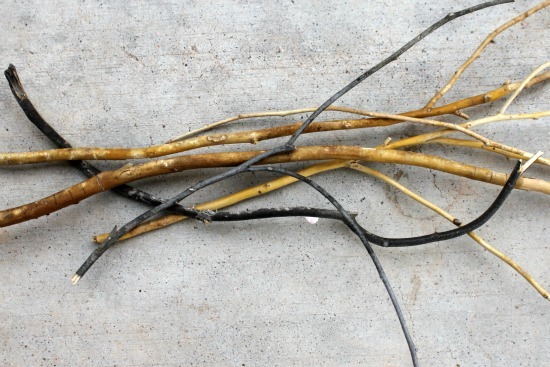 Take care to avoid dead plant material – it burns a little too well if it accidentally catches fire. And remember – campfires will shoot sparks no matter what. Ideally, the firepit should be bare dirt (never on live grass and especially not on dead grass or needles – can you say forest fire?) If there is no bare dirt available – use a rake or shovel to remove the plant material until you get to the bare dirt. Your firepit should be no more than 3 feet in diameter and about 3 inches deep. If you can find large rocks to place around the pit – do that. You’ll want to keep a bucket of water, a bucket of loose earth, a shovel, and a rake by your firepit as well. 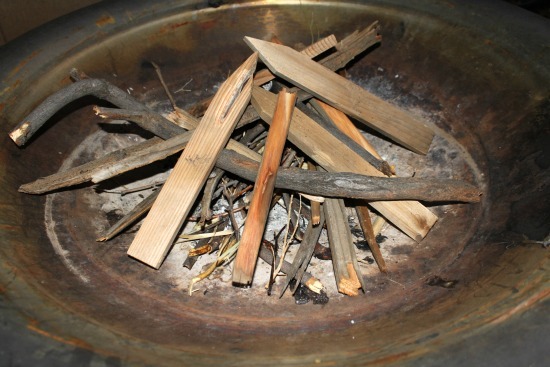 Depending on where you’re camping there are usually rules that govern what wood you can use for your campfire. Most places I’ve camped the rule is simple – don’t bring in wood from elsewhere. You might inadvertently introduce non-native pests to the area. If you’re not sure – you can usually find the information online in advance or at the campground host or ranger station. Kids are excellent helpers when it comes to gathering wood. My Girl Scouts love to gather wood when we get to camp. 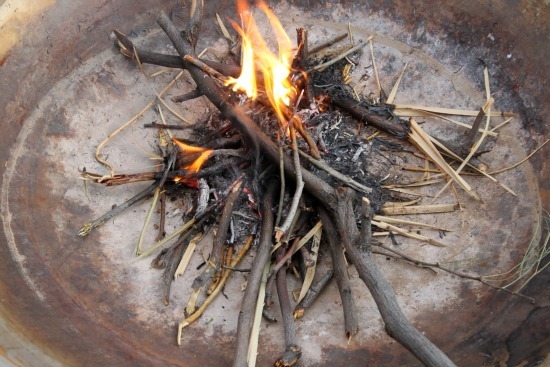 There are three types of fuel you’ll need to get your fire started. Tinder, kindling, and fuel wood. The drier your wood – the easier it will be to start your fire. Fire starters are also a helpful thing to bring along. 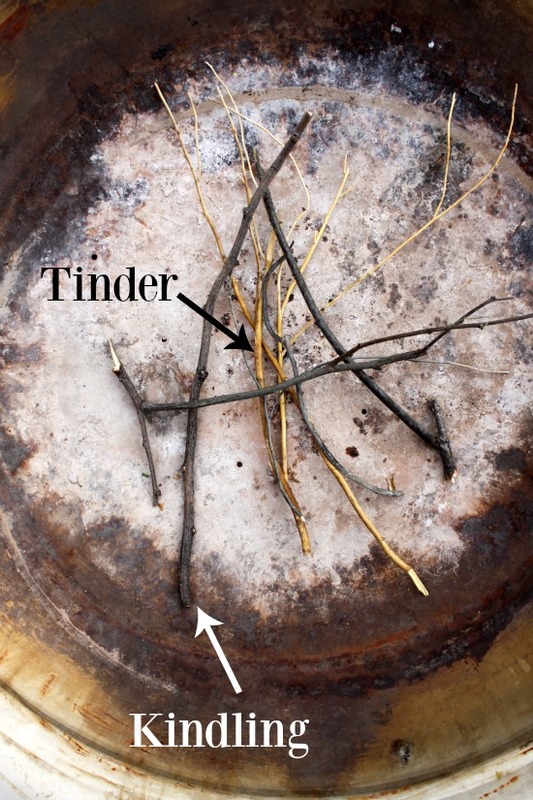 Tinder is thin, dry twigs that are thinner than your pinky finger and easily broken. Tinder will catch fire with a match or lighter. 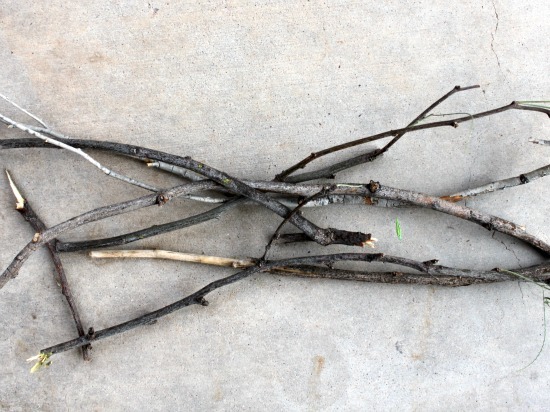 The picture below is deceiving, but these are little tiny twigs. Kindling is pieces of wood that are thicker than your thumb, but smaller than your wrist. Kindling can be broken easily with two hands. Fuel wood is anything bigger than kindling or tinder. It usually can’t be broken by hand. It should be short enough to fit inside the firepit – if not – it should be cut to size using an axe or saw. The A-frame (also referred to as the Foundation or Triangle) is as simple as making the letter ‘A’ with kindling or small fuel and putting tinder underneath. 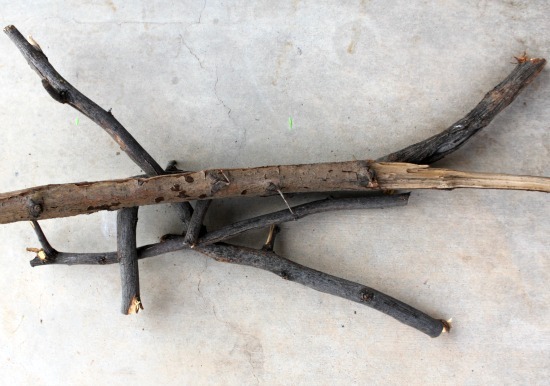 You place two pieces of kindling into an upside down ‘V’ and then place an additional piece of kindling on top of the first two (so there’s space underneath the third piece.) In that space – you put tinder and if you’re like me – a fire starter. I put a very bare layering of wood in the picture below so you can get an idea of what goes where…for a successful fire – I’d add more tinder and kindling before adding some fuel wood. Here’s a shot with my preferred fire starter – a paper towel or toilet paper tube stuffed with dryer lint. Did you play with Lincoln Logs as a kid? If so, this one will come naturally to you. A Log Cabin is essentially a set of logs stacked in layers (ideally with an A-frame in the middle to get it going.) Start with an A-frame – then layer fuel wood around it in layers – exactly like you did with Lincoln Logs. Each layer should pull in a little closer to the middle – so in the end you end up with a teepee that allows for air to flow around the heart of your fire. 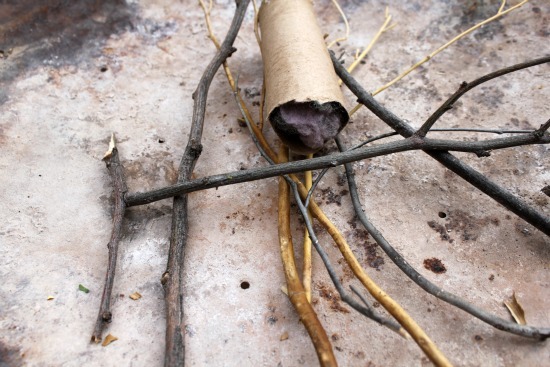 The key to lighting your fire successfully is to light the easy-to-light parts (fire starters and/or tinder) and let them spread the fire to the harder-to-light parts (kindling and fuel wood.) With the A-frame, light the tinder underneath the ‘A’ at several points. I still need several matches or a lighter because I’m a bit gimpy, but I know there are folks out there who can light the entire fire with only one match. As the tinder lights, carefully add more pieces of tinder as your fire grows. Do NOT throw them on, place them carefully and gently on the fire. You don’t want a bunch of sparks thrown in your face. Also, add them bit by bit – don’t get too excited and put a whole bunch on at once – you’ll smother the fire. As the fire grows, add larger and larger pieces of wood. You won’t add much fuel wood until you have an established fire going. The best thing to do as far as putting out the fire is to let it burn out on its own or burn out as much as possible. But please, please don’t leave your fire unattended. That’s how truly awful forest fires get started. And don’t make the mistake of thinking that just because you’re in the desert that wildfires can’t happen – they can and do. Sage and other desert plants can be incredibly dry and burn very well. Fires take an incredibly long time to burn out so keep that in mind as you plan your campfire. There’s nothing worse than having a roaring fire going and realizing you have to leave…it’s much more work to stop an active fire than one that’s nearly burnt out. Girl Scouts use something called the sprinkle stir method. You sprinkle some water on the ashes, stir with a rake or shovel, and then do it again. Keep sprinkling and then stirring until you no longer see a lot of steam coming from the ashes. Then you can sprinkle a larger amount of water on the fire bed and stir until the fire is completely out. The fire is completely out when you can place your hand on the ashes and not feel any heat. But please – don’t just stick your hand down there…place your hand above the ashes (without touching) and feel for warmth. If you don’t feel any – sprinkle some more water and stir, then hold your hand above the ashes again (still not touching.) If you feel no heat at this point, you could cautiously place your hand on the ashes to make sure the fire is completely out. Once your fire is out – rake your fire pit area and remove remaining coals and ashes. You want to leave your fire pit as tidy as you found it. Many campsites have a certain place to dispose of ashes – you can ask the ranger or camp host. If you’re not at a campground – sprinkle them carefully around the area you’re in or bag them and take them with you to dispose of at home. Our rule of thumb is you always try to leave a firepit the same or better than you found it. Enjoy those campfires and the s’mores than come with them! !